We all have gear lust from time to time, especially when you see your favorite artists using their signature instruments. Usually these are instruments with hand selected materials, hand crafting, and unique embellishments that push the retail price up into the stratosphere for us common folks. I have made it a practice to research, and research, and research, to find comparable instruments at prices almost anyone can afford. I had fallen in love with the Martin OMJM John Mayer signature model acoustic for its classic styling, bright but flavorful tone, and friendliness to fingerstyle playing. But a Martin north of $3000 wasn’t my the cards (and probably will never be). So I began my search. I examined what gave the OMJM it’s character: solid spruce top and rosewood sides and back, x-bracing, open-geared tuners vintage butterbean knobs, solid ebony bridge, beautiful rosette and ivory binding, mother-of-pearl peg dots and fret markers, and a vintage tint top. Tall order for my $500 price range…. Then I found the Recording King RO-227. For those of you who don’t know, Recording King began as a house brand for Montgomery Ward in the 1930’s. Based in Hayward, California, their instruments were developed during the Golden Age of musical craftsmanship. They faded away along with many manufacturers of that period, but the brand was revived in 2007 by Johnson Guitars U.S.A. in Arizona and is a subsidiary to AXL Corporation. The RO-227 is an OM-style acoustic with strikingly close specs to the Martin OMJM. You can see the specs stacked up below, and I’ve highlighted the ones that they share. Had I really found an American-heritage acoustic that measured up to my coveted Martin? The crucial test of course: how did it sound? The answer was: extremely good. It sounds great – better than my $500 paid for. Much better. I will admit, I still love the OMJM. I got some time with one at a wonderful little guitar shop in New London, CT a few weeks ago….and I’d be lying if I said it wasn’t a magnificent instrument. There’s a character about it that’s alluring. Notes just pour out of it and ring for days. But people say the same about my RO-227. The difference between the two is there, but slight. Is it a $2500+ difference?…..absolutely not. I can’t say good enough things about the Recording King RO-227. If you’re looking for a classic OM-style acoustic that gives you practically the same materials, hardware, and vibe as the OMJM that won’t break your bank….this is it. If you have found others like the RO-227, share it with us. I can relate to every single word you’ve written. I’ve just got my ROS-627 (had it just over a fortnight now) and chose it for exactly the same reasons you chose your RO-227. The 627 has an almost identical spec to the Martin 000-28VS and I felt that with that specification it would be difficult to go wrong: AA grade sitka spruce top, solid East Indian rosewood back and sides, one piece neck with hand cut dovetail joint, ebony bridge, ebony fingerboard, hand buffed nitrocellulose finish… the list goes on. Like you, I read up everything there was to read about it and there was rarely a negative comment. The only negatives from some people were the ‘made in China’ and the V shaped neck. I prefer a wide, chunky neck, always have, and the ‘made in China’ wasn’t an issue. 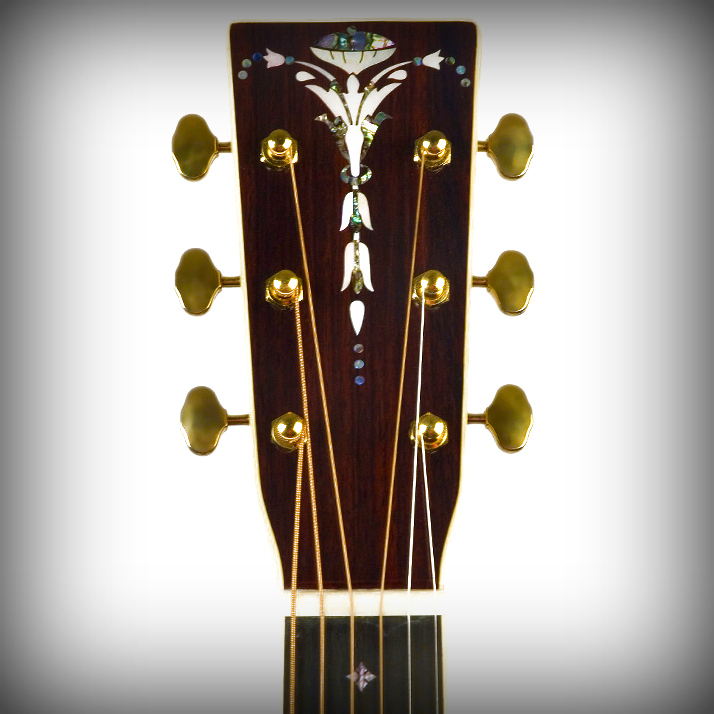 Recording King really does put a lot into their top end models and the woods are beautiful and the finishes perfect. It’s starting to ‘play in’ already and with that spec will only get better as the years go by. I’m really pleased wit it – again, like you, there was no chance I’d be in the position to spend £3,000 – £4,000 on a guitar and for £600 outlay I feel I can give myself a pat on the back for the effort I put into research and for choosing wisely based on an extremely well calculated risk. I now have the small bodied, 12 fret, slotted headstock guitar I’ve been pining after for years and being Scottish getting it for that price is a terrific bonus! Good to know others have discovered and are appreciating Recording King! It was a great find, and I love the instrument. And it’s also nice to hear from a fellow Scotsman (I was born in the U.S., but my grandmother came from “The Old Country”). With a name like Alloway I should have guessed – Burns country… just a few miles from Dumfries where I come from, I live in England now. Yes, it would be good to hear from others who have ‘lucked out’ with Recording King guitars, let’s hope you get more posts on this very interesting topic. This entry was posted on July 13, 2013 by davealloway2001 in Instruments and tagged Acoustic, Guitar, Instruments, John Mayer, Martin, Music, OM, Recording King. Custom Pedalboard For Under $100…and Easy. Clones Clones Clones Clones Clones Clones Clones Clones….